These fences are gorgeous as they present you with tightly packed planks with a lovely lattice pattern on top. Very popular with wood fences, and a great addition to your backyard. It’s extremely decorative and looks good in natural wood form. Bring an iron fence into your home if you really want to improve your landscaping. 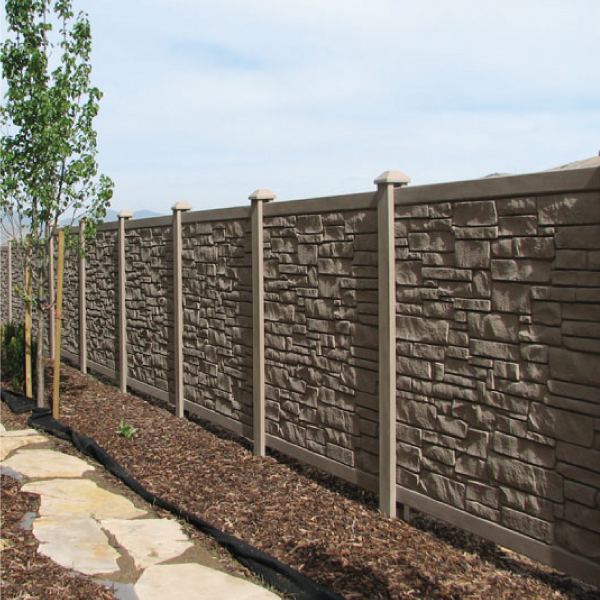 These fences use high-quality iron rails with ornamental concrete posts between them. When combined with pyramid post caps, the look is even better. One of the most popular around right now – a dog ear fence features a unique design with an inverted curve at the top. The posts are the highest point in this fence, and we believe it looks stunning. It’s an excellent option for anyone seeking out PVC fences as the design works really well with a range of bold colors. A sophisticated design that almost forms an optical allusion. Here, the planks are attached on each side of the fence frame in an alternating fashion. From face on, it looks like a completely flat fence with no gaps at all. This offers fantastic privacy in your back garden. But, when viewed from a side angle, you can see slight gaps that let light in. It’s quirky and gorgeous. Something of a statement design that features lots of think fence panels with a series of points. Works well in both wood and PVC, and really adds character to either your back or front yard. If you want an amazing fence that’s designed beautiful, then contact Fence Masters today. We’re the leading fence installer in Ottawa, so let us bring a new fantastic creation to your property.